It’s very cold here and today’s recipe will warm your heart. It’s from my friend Paula’s blog, My Soup for You, and it’s a delicious fudgy brownie with a hint of raspberry. To me, there’s nothing more decadent than chocolate and raspberry together. I have always loved it. I love it in chocolate raspberry chip yogurt, in a big box of chocolates and pretty much any other way I can get it. So on Superbowl Sunday night when this link appeared on my Facebook timeline, I gasped out loud. I don’t like football, but I love my friend Paula’s blog, I love a great brownie recipe and I love the addition of raspberry jam in the recipe. I examined the ingredients and I had them all, as long as I substituted the same amount of brown sugar for the turbinado sugar, and as long as I used the Pillsbury Gluten Free flour blend that I’ve been using in most of my baking so that everyone could eat them. In fact, as luck would have it, I’d just bought a new jar of raspberry jam that very afternoon, so I was in business. The new recipe gave me the opportunity to use a new cooking tool from my Pampered Chef hostess gifts, the small micro-cooker. I had decided to start small and order the small one first and if I felt I needed the next size, I could order the large one at a later date. I really loved this new tool! I was able to melt my chocolate, butter, brown sugar, white sugar and jam all in this one small cooker in the microwave. It made making these brownies very easy and with minimal cleanup afterwards since I used so few bowls. I am someone who has burned chocolate chips in the microwave in the past, so this was a great addition to my cookware and I was relieved not to see any smoke or charred chocolate this time around. I also used another little Pampered Chef tool that I got from my hostess benefits: the test and release tool. It’s a cake tester on one side and a tool that allows you to go all around the edges of your baked goods to easily release them from the edge of the baking dish. It’s curved just enough to get underneath the baked goods a bit. I’ve used it with cupcakes, banana bread, and now brownies, and I love it every time. Pampered Chef always seems to know what we need and creates it for us. This was such a simple concept and yet, so helpful. Our brownies were a huge hit on Superbowl Sunday and throughout the rest of this week as we munched away on the leftovers. I’d most definitely make them again. Making them gluten free did not seem to change the recipe at all. The consistency of the brownies was great, and the taste was perfect. I’m also sharing a tip with you today. I shared it on Facebook on Sunday night as I was posting about my brownies and some people had heard it before, while some people had not, so I thought I’d add it in here as well. Last year I was cutting still-warm brownies at some event or other and they were getting all gunked up on the knife that I was using. My Grandma Grello, (who happens to be a die-hard Patriots fan, by the way) was watching and she said to me, “You need to use a plastic knife. If you use a plastic knife, the brownies won’t do that.” I suddenly remembered her advice when I was getting ready to cut the brownies last week, which were in fact, still warm. I went into my pantry closet and got a plastic knife. Sure enough, they were very easy to cut, with the knife sliding right on through each and every row. Grandma Grello has 95 years of experience under her belt and she’s been cooking and baking with the best of them throughout those years. I take anything she says as pretty solid advice. I wouldn’t pass it along to you if I didn’t! With Valentine’s Day coming up this weekend, this would make a great treat for you or your loved ones and it’s certainly cold enough here to enjoy a warm treat, just make sure you use a plastic knife when you cut it! This chili looks almost too good to eat! Don makes a great chili, he really does. I’d never even HAD chili until I met him and had his. I also had never had peppers or onions because growing up my dad didn’t like either, so we steered clear of them when cooking. Now though, I eat all of those things and I especially love my husband’s chili. It’s perfect for Superbowl Sunday. 3) Add all other ingredients and cook on low for two to five hours. If you’d like to cook this in the crock pot, cook up the meat first and then throw it all into the crock pot to cook on low for the 2-5 hours. This is the sort of recipe you can make according to your taste. The spicier you like things, the more spicy ingredients you can add to it (hot sauce, chili powder, chili peppers etc.) The more mild you like it, the less you add. A bonus appetizer that you can use some of your chili to make. 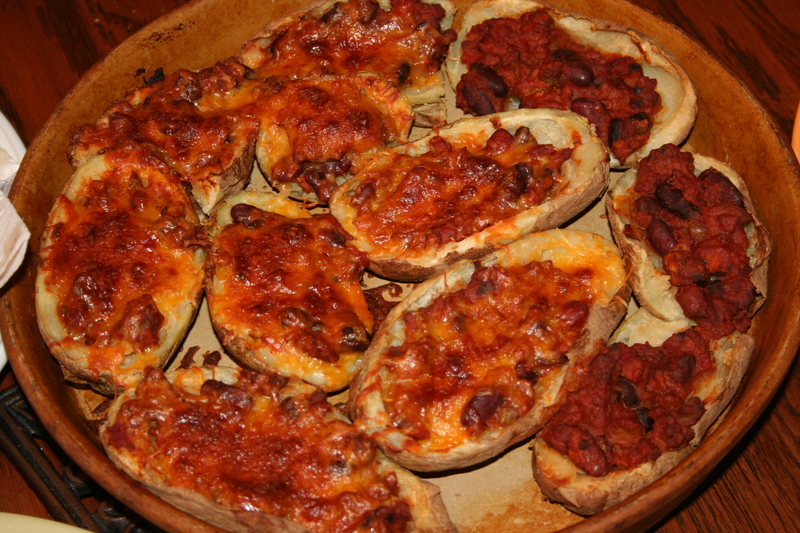 We love potato skins and chili seems to lend itself to an additional appetizer idea: Loaded chili potato skins. Cook up a bunch of baked potatoes ahead of time. Let them cool a bit. Cut them in half and hollow them out, leaving about 1/4″ to 1/2″ of the potato in the skin. Add some of your chili and some cheddar cheese to the inside, and bake them until cooked through. Broil at the end to crisp up. Add your favorite toppings: sour cream, guacamole, etc. We are big Patriots fans here! I hate football. Yup, I’m a buzz-kill when it comes to football season, (and also baseball season) Superbowl, anything like that. However, I love food. So, featuring Superbowl Week, several days of recipes you can cook for the upcoming Superbowl Sunday feast, works for me. The cool things about these recipes is 1) none of them are recipes I grew up with and 2) they are all recipes I would not have, had I not had these people come into my life at some point or another. To me, that makes them extra-special in a different way than the ones I treasure from my childhood. Today I am featuring several recipes at once. 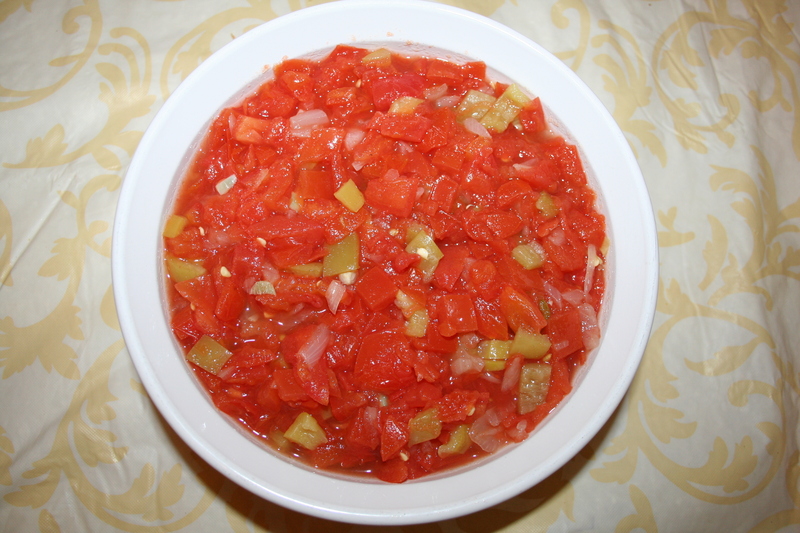 The first is a Homemade Salsa recipe from my friend and college roommate, Karen. She first shared this recipe with me when we were in college and I’ve held onto it, making it ever since. She is also the one who introduced me to my husband when we were out back in December 1992. But, that’s a whole other story for another day. This is what Karen’s Homemade Salsa looks like when it’s all done. peeling and coring is the most time-consuming part of the recipe. The rest is quick. Combine all ingredients in sauce pan, bring to a boil. This next recipe is from my brother’s mother-in-law, Marianne. She makes a kickin’ guacamole and ever since we first tasted hers, it’s been the one we make as our own. Had my brother not married his lovely wife, we would not have this recipe to share with you! Unfortunately when we made this recipe last weekend, along with the above salsa, I took photos of the salsa but forgot to take photos of the guacamole! So next time I make it, I’ll add a photo here. But, you all know what guacamole looks like….green. The last recipe is one I haven’t made in a while, so I don’t have a photo yet, but again when I do, I’ll add it in. However, my friend Stacey brought this to a cookout at our house one year, I think a dance recital cookout we were having about ten years ago. It was so good and she said she got it off the side of a can of Bush’s Black Beans. I have made it since then and I think of her every time I do. Refrigerate for at least 1 1/2 hours. 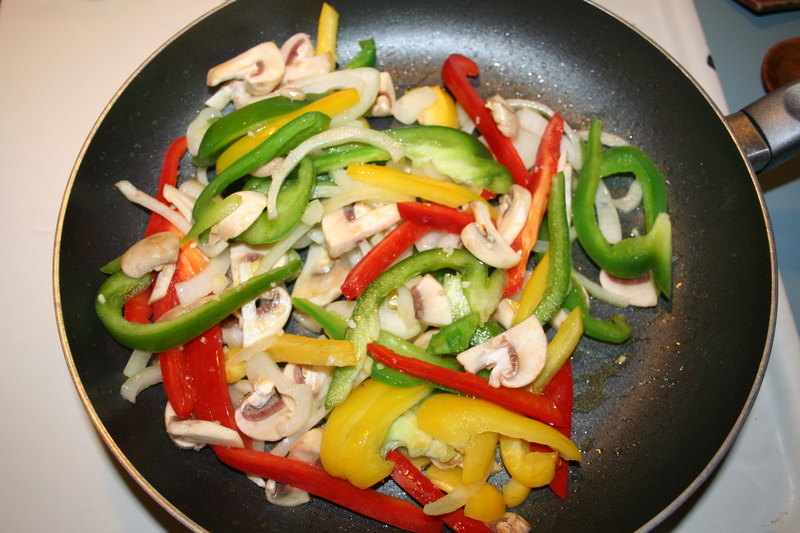 I love the look of fresh vegetables when they’re mixed up and cooking! Today’s recipe is again, one that I did not grow up with! Imagine that, four recipes in two days, and not one of them was from my childhood! This recipe is a combination of recipes from two different people and it makes a great meal or an appetizer for a football game. 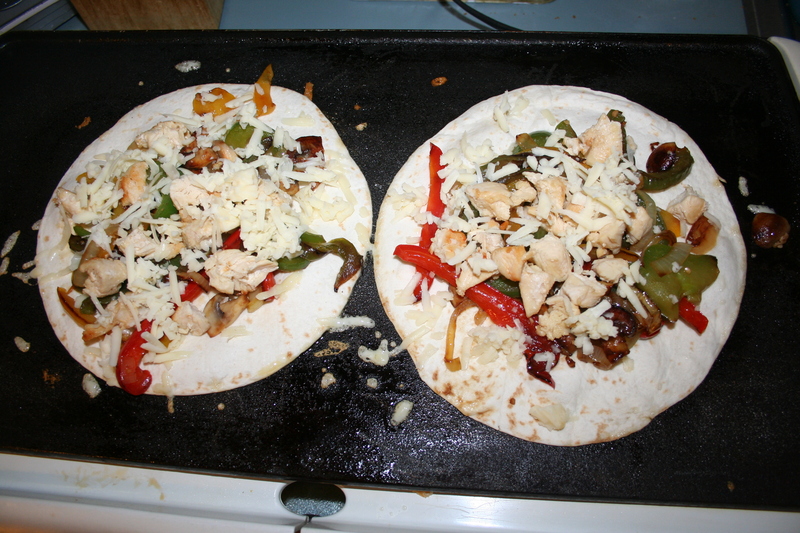 Anyway….we started making quesadillas at our house on a regular basis. You can put anything in them so we’ve done just cheese, chicken and cheese, tomato/chicken/cheese, peppers/beef and cheese, and we’ve done bbq chicken/onion/cheese. However, on New Year’s Eve this year my sister in law Jessica made us Fajita Quesadillas which had all kinds of peppers, mushrooms, onions and cheese, and they were so fabulous!! We had to try them at home. So last week, we had them. Cook up some chicken tenders first. Then shred or dice the cooked chicken. My sister in law and I are both lucky because we both live near an Aldi’s and you can get everything you need for your Fajita Quesadillas at Aldi’s. The ingredients vary, depending what you’d like in your quesadillas. You need soft flour tortillas, we use the large ones. This is another meal where I pull out some frozen chicken tenders, so convenient! Cook them up if you’d like chicken in your quesadillas. 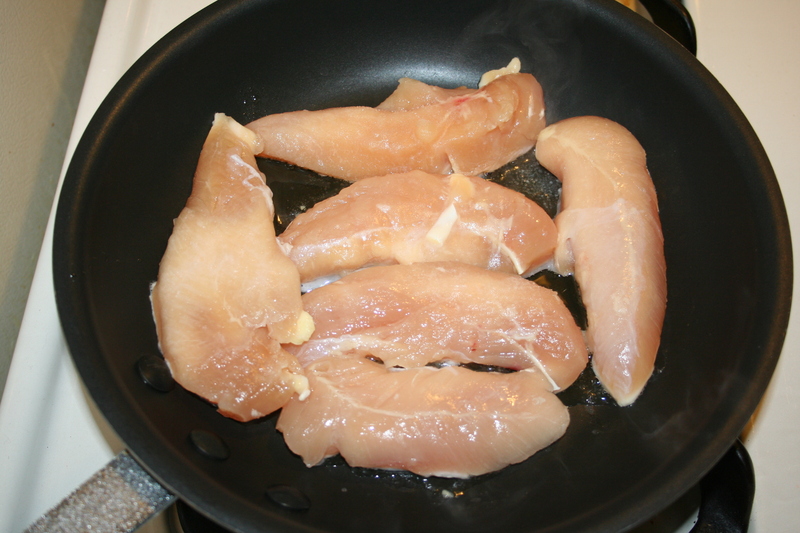 While your chicken is cooking, grate a bowl full of cheddar cheese (a block of cheese is usually plenty.) Slice up your veggies and cook them on top of the stove. We use a countertop griddle to make our quesadillas two at a time. Once both sides are golden brown and the cheese inside is melted, you’re ready to cut your quesadillas into triangles and eat them! 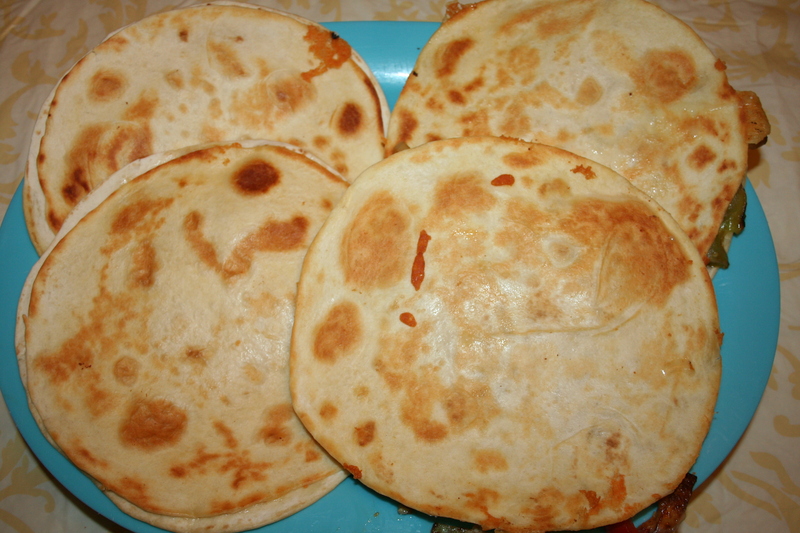 Once the quesadillas are golden brown, cut them into triangles and eat! Mystery Ride to a new-to-us zoo! 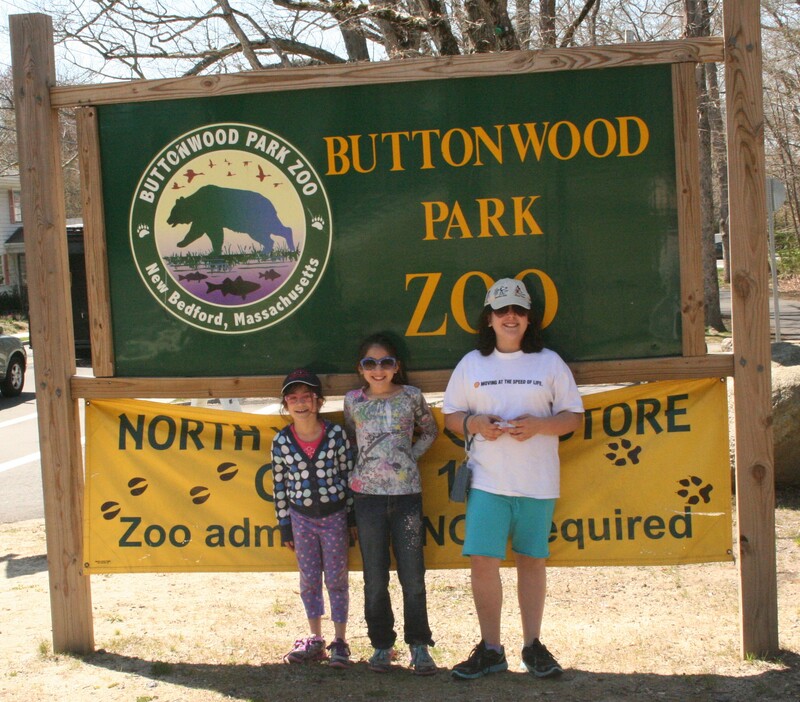 During April Vacation week when we were looking for fun things to do as a family, Don came across the Buttonwood Park Zoo, which was about 45 minutes or so from us in Massachusetts. We actually have a zoo about 10 minutes from us, but we’ve been there lots of times and we were looking for something new, different, and inexpensive. We found it at the Buttonwood Park Zoo. We packed a picnic lunch plus snacks for later, and planned to find a spot to eat when we got there. We parked on a nearby residential street since the lot was full when we arrived. The zoo is in a beautiful area and there’s plenty of spots for walking, jogging, bike riding all around. It was a gorgeous day and people were out everywhere. It had such a great atmosphere about it. We loved the fact that it only cost our family $21 to get in; very budget-friendly and less expensive than the zoo near our house. You had the option to purchase tickets for pony rides, train rides and carousel rides, but we said no, no and no again. At least for this time we were opting to just try out the zoo. We knew that we had plans the next day as well, so we had to stay fast to our budget and we explained that to our kids. As a parent, now that I’ve seen the train and carousel, I would not spend the money on them in the future most likely. We have a much larger carousel nearby, two of them actually, that are cheaper (it was $2 per ride on the carousel at the zoo) and the train was really tiny, better for preschoolers, but I think I’d be tempted to let them try the pony rides if we went back. 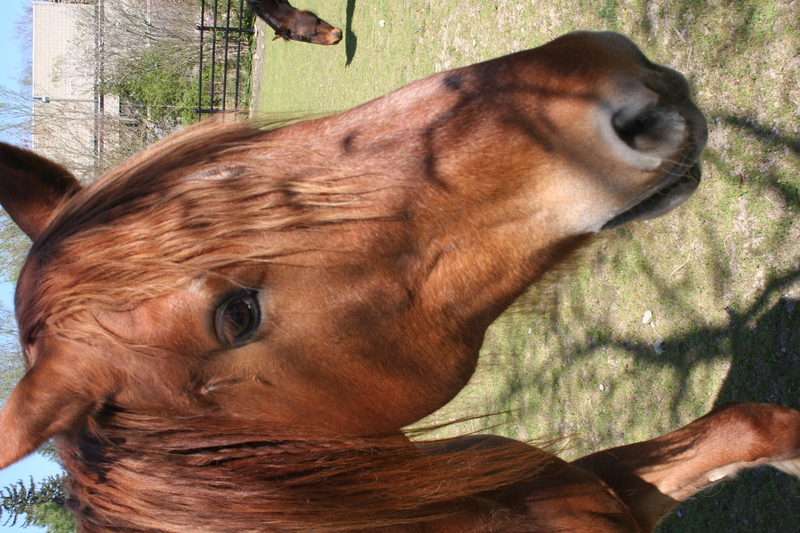 This horse was *this* close to us. We pet her, fed, her and talked to her. She was absolutely beautiful. We visited this part of the farm area twice, just to see her. Overall, the zoo was wonderful. We found a place to eat right away, in a very clean outdoor area that had tables and chairs already set up for us. There was also an indoor food court where you could buy food there and eat it inside if you wanted to. Because it was April Vacation week they had an area just inside the entrance where they were doing crafts but we didn’t participate because we were anxious to get in, eat and get started walking around. The zoo had a mix of all kinds of exhibits including (but not limited to) bald eagles, elephants, black bears, river otters and my kids’ absolute favorite: the horses. There was lots of space to walk and an entire Buttonwood Farm area with sheep, roosters, goats, and rabbits. There was also an indoor aquatic exhibit that had snakes, birds and fish native to our area. And horses. Did I mention there were horses? We spent about 2 1/2 hours or so walking the zoo. Although the lot was full, you didn’t feel crowded or as if you were walking in a herd of people. We saw the whole thing and between us we took over 200 pictures. It was a gorgeous day, perfect fora day at the zoo. We enjoyed the variety of exhibits that gave us a change from our regular zoo as well, even though we love it there also. I’d definitely go back to the Buttonwood Park Zoo and if you live anywhere within driving distance to the New Bedford area, I highly recommend that you give it a try, especially if you’re looking to stick to a budget. It’s extremely affordable and you get a great deal out of the experience for the money you pay. I’d definitely go back again, and my kids, well they’re saving their money now. They want to buy a horse. Don't let Superbowl Sunday be a loss for your diet! One of the things I love about modern technology is the ability I’ve had to reconnect and stay connected with so many people, near and far. One of the people I’ve reconnected with most recently is my friend Debi from college. She is what I consider to be a Weight Watchers Success Story. She has lost 70 pounds while on the program and is now a Weight Watchers Meeting Leader, helping other people meet the same success she has had on WW. When she approached me last week about using our chili recipe for her upcoming WW meeting, and computing the WW points for it, I immediately said yes and asked her if she would share her findings as to how healthy the recipe actually was (it seemed healthy enough to me) when she finished. I asked her to be a guest blogger for today’s post. Tomorrow is the Superbowl and I thought it was important to remind everyone that the Superbowl is just one day, but diets are a day in and day out commitment. Don’t let one day throw you completely off the wagon. Here is Debi’s post. Thanks Debi! Super Bowl – Beyond the Game: Let’s Talk Food! 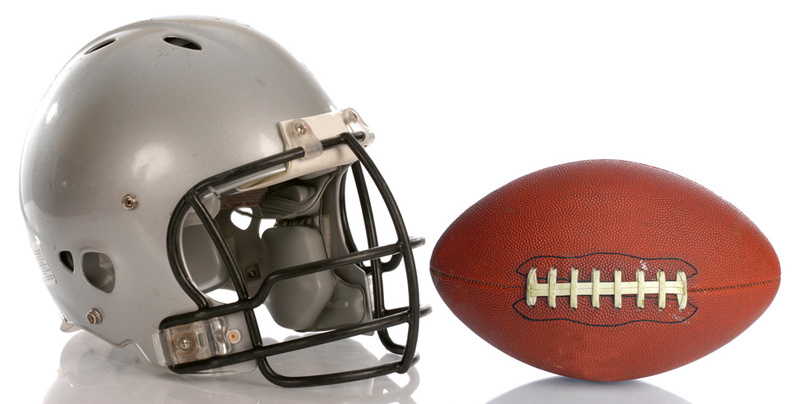 Ah, the Super Bowl, what’s better than a day filled with football, friends and food? Of course, the day would be perfect if YOUR team won! I’m not so concerned with which team wins. I’m more interested in the game itself and how it’s played. I cheer when someone makes a good play and route for the underdog when they just can’t seem to get their act together. With the Super Bowl just one day away, and not being concerned about the game, my focus here is on the food. I can’t help but think of all the extra calories that people across the country will be mindlessly consuming on game day. While you’re hooting and hollering, do you ever stop and think why are you eating all those tortilla chips? Are you really hungry? Do you even know how many you’ve eaten? How many beers did you drink? Were you really thirsty? Better yet, do you even remember what the beer tasted like? Being mindful of what and how much we are eating usually takes a back seat to the excitement of the game. But, it doesn’t have to play out this way. A couple of years ago, I would have been one of those people mindlessly eating. However, after joining Weight Watchers and losing 70 lbs., I have a new perspective when it comes to food; even more so now that I am a Weight Watchers meeting room leader. Earlier in the week when I started preparing for this week’s meeting, I immediately knew that the timing of this week’s topic was purposely planned to help members think about how to make better food choices during the Super Bowl. I remembered that Jen had posted a Chili recipe recently and asked her if I could borrow it to illustrate how making simple ingredient substitutions can make a dish healthier. To help guide members’ weight loss, Weight Watchers assigns a numerical value called a PointsPlus Value (PPV) to all food and drinks. Combined with Weight Watchers’ proprietary, scientific formula, determining the PPV of a recipe requires you to know three things: the ingredients, the serving size and how many servings the recipe makes. Well, Jen posted the ingredients (refer to her Chili recipe posted on Jan. 27th), but when I asked her about the latter two, she admitted that she didn’t know. After discussing the ingredients and comparing them to other similar recipes, we estimated that the Chili recipe makes approximately 24 – ¾ cup servings. Therefore, the Chili recipe calculates to 7 PPV per serving. By replacing the regular ground beef with either ground turkey or 95% lean ground beef, the PPV decreased to 5 PPV. 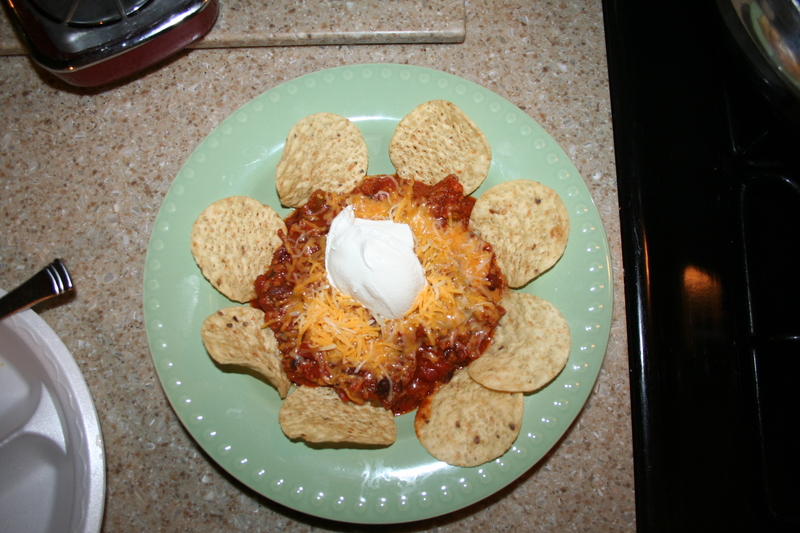 However, this does not include the cheese (1/4 cup = 3PPV) or the sour cream (2 Tbsp = 1 PPV) that you put on top of it, or the tortilla chips (12 chips = 4 PPV) that you choose to have alongside it. So, the Chili itself is relatively ‘low-cost’ item. But how many of you actually measure how much you are eating? And, is this the only thing that you will eat? If you documented what you actually ate and drank throughout the game, the quantity may surprise you. Also, how many of the recipes are made with lower-calorie or healthier ingredients versus the regular, full-fledged ingredients? One of my members reported hearing that after Thanksgiving, the Super Bowl is the second biggest eating day of the year. How much food do you eat during the ‘festivities’ compared to a ‘normal’ day of eating? Perhaps you never thought about that before, but it is never too late to start looking at food differently. Weight Watchers has taught me how to WIN the food game regardless of the event, holiday or circumstances in which I find myself. Only eat when you are hungry, be aware of what and how much you are eating, and take control of your game! Sit or stand away from the food. Being closer to the food lends itself towards mindless picking. Stay farther away from it so you have to make a more conscious decision to go get the food if you want it. Practice portion control. Be mindful of the size and quantity of the servings you consume. Bring a healthier snack with you to the party. Modify your recipe with lower-calorie/fat ingredients. Or, choose to bring some fruit or vegetables that you can pick on. Drink wisely. Liquid calories add up quickly whether it’s from beer, wine or even regular soda. Choose lite beer, diet sodas or even water! Drinking water (even if in between each beer) will help keep you hydrated, keep you from mindless snacking and help you feel full so you don’t over indulge when you eat. Get into the game. Focus on the game and socializing with friends. The more time you spend watching the game and cheering, or groaning, the less time you’ll be eating. We cannot control the outcome of the football game, so may the best team win! However, you can make healthier choices and control the outcome of your food game. Plan ahead and join the winning food team!